Beyond the Sky, an indie sci-fi/thriller from director Fulvio Sestito, is set as a film within a film. The story follows a documentary filmmaking duo, Chris Norton (Ryan Carnes) and friend Brent (Claude Duhamel – no relation to yours truly) who head to the UFO capital of the United States, Roswell, New Mexico during an annual UFO convention intent on disproving the validity of the claims of alien abductees. Chris has his own personal history with UFOs, having heard stories from his abusive father his whole life about how his mother was abducted when he was a child, but he’s never believed them. Now is his chance to finally disprove the entire alien/UFO culture. While in Roswell, Chris and Brent encounter a woman, Emily Reed (Jordan Hinson), who claims she has been abducted by aliens every seven years, since her seventh birthday, and with a birthday looming in four days – seven years since her last abduction – she expects to be abducted again. For some reason, Chris is drawn to Emily, both to find out the truth about her abductions and to protect her. What transpires as Chris, Brent, and Emily investigate further, even the skeptical Chris wasn’t prepared for and he begins to suspect that there may be more to the claims of these abductees than he was ready to admit. 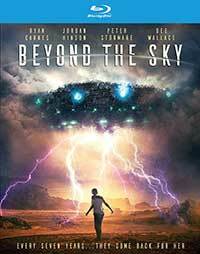 Beyond the Sky has a lot to like for fans of sci-fi, alien abduction believers, and lovers of genre films, not the least of which is a small role for scream queen Dee Wallace. In his first feature film, director Fulvio Sestito manages to craft a lot of atmosphere and slick visuals on the meager indie budget. That said he isn’t given the greatest cast to work with. Ryan Carnes has no charisma and is hardly believable as the cynical skeptic. This lack of charisma hinders any and all chemistry between him and Jordan Hinson, which feels forced. The best member of the cast is the easygoing Claude Duhamel, and I don’t say that just because we share a last name. The story in this film also gets quite confusing in the finale. I won’t say much to spoil anything, but there’s a big reveal and a misdirection, but that leaves some plot holes. The script could have used a rewrite to fix the final act. Beyond the Sky arrives in a 1.85:1 aspect ratio in an AVC 1080p encodement on Blu-ray. The film was shot in HD in varying degrees of quality, being that it is a film within a film — about a documentary crew who find themselves part of the story, so some of the scenes are purposely lower quality for artistic reasons. That said, the transfer is good although there is some noticeable banding and the lower quality scenes that have noise and lesser detail. Beyond the Sky comes to Blu-ray Disc with a strong English DTS-HD Master Audio 5.1 mix. It may be behind the times as far as audio formats go, but this balanced and atmospheric track is engaging with lots of subtle sound effects mixed through the surround channels, deep lows and clean and full dialogue. These included special features feel like throwaways, but they do keep the alien abduction theme going. It’s an interesting choice to have a brief interview from a UFO convention with the famous “alien abductee” and author of Fire in the Sky, itself adapted into a film. Beyond the Sky is a valiant effort for a debut feature film director and some genre fans may like it. It does keep one guessing and have elements of tension and mystery, and even a bit of visual effects that don’t quite work as well as they should have. Still, it’s a mostly satisfying film and a solid Blu-ray release. A provocative documentary filmmaker and his crew head to Roswell, New Mexico to disprove the stories of alien abductees, but while there they come across a woman whose story leads them into a situation that forces them to question their preconceptions. 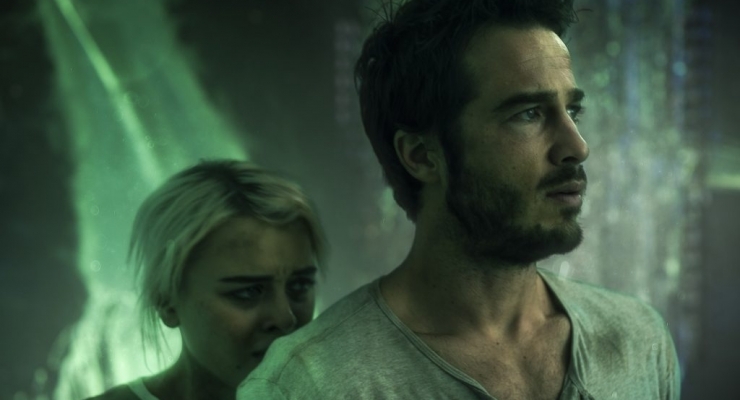 Beyond the Sky has some flaws, most notably the casting of Ryan Carnes who puts on a non-charismatic performance, and the final act where the script get a bit muddled. But the visual aesthetic and inventive use of sci-fi tropes will satisfy genre fans and the solid albeit barebones Blu-ray release from RLJE Films makes it worth it for collectors.